I was privileged to be invited to join them on that recent morning. I told bits of the story of my friendship with Fred Rogers but spent more time talking about my recent experience writing a book about grief with my therapist friend, Dr. Patrick O’Malley. One of the ways Patrick helps the bereaved understand their own feelings and experiences is by exploring the story of their loss. I told the guys in Arizona about Scott, a young construction worker who came to see Patrick after the death of his father from a sudden heart attack. Scott, who was there at the request of his wife and pastor, wanted no part of any psychological mumbo jumbo. He just wanted to tell the story of his dad, who had been his mentor and hero, who had guided him through boyhood, taught him to be a man and later offered Scott a partnership in the family business. Scott finally broke down in Patrick’s office when describing the day of the heart attack, this strong, man’s man shedding unabashed tears of sorrow. Pastor Tim and his little ones. That morning was the first of several days I spent with Tim Wright and his people. More about that profound time in the next post. In between events at the church, I was able to escape into the desert for a couple of long hikes, a nature experience so different than the Colorado Rockies that have been my spiritual home for decades. 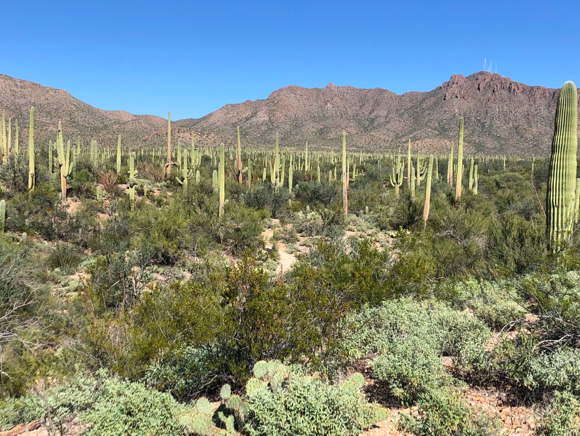 The desert mountains, the brilliant sun, the saguaros, the quiet, was a revelation to me, mesmerizing beauty in such a comparatively stark landscape. But while hiking, my mind kept returning to the guys of that Bible study and to my own dad. As many of you know, my relationship with my dad eventually became the cornerstone of my friendship with Fred Rogers. All my life I had been trying to get my father to be proud of me, and by the mid-1990s, when Fred and I met, I had never felt I had succeeded. Thus, my question to Fred in a letter. Would he be proud of me? My dad, Myke, and mom, Lois. So I started to remember by own childhood, when my dad never missed a game, no matter what. He wasn’t always so happy with my performance, but he was always there. I remembered his struggles with depression, how he soldiered on in the days before medicine and therapy, getting up every day to support a large family with12-hour days. His faithfulness to my mother. His integrity. The knowledge that, for all his limitations, he had given me so much more as a father than his dad had given him.